I was so touched and excited to have been honored with the "You Make My Day" award by the articulate and talented, over-the-top, on a quest for beauty in an upside down world, Topsy Turvy. 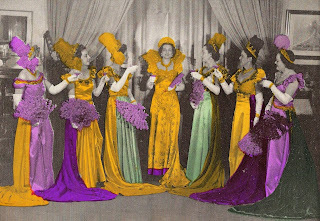 Started by Carolina Eclectic, its a truly imaginative way to give an appreciative accolade to fellow bloggers who inspire and entertain us, and to share blogs we love with other bloggers who may also enjoy them. 1. Write a post with the links to 5 blogs that "make your day". 3. Tell the award winners they won by commenting on their blogs. I had so much fun with this, but couldn't narrow it down to just five, so here are the six blogs that "made my day!" 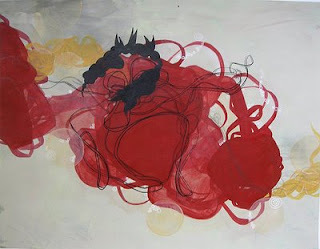 Things that Inspire was one of the first blogs I found, and from that day forward, it has been a favorite because Sarah brings such insights into the world of design and architecture. Her posts are both beautiful and educational and I really admire her ability to create an in depth look at her subject matter. I love the rooms she chooses to include in her posts because they are true to her taste. I am also happy that she has become my friend! I love the name of Habitually Chic's blog because it is so darned true. This girl makes being chic and writing about all that is chic a wonderful habit. It just comes naturally to her and I never get enough of reading her observations and opinions on all that is stylish and of course, chic! Her pictures never fail to inspire. An example, this unbelievable photo of this bridal dress and train just blew me away! What can I say about All Things Bright and Beautiful? The photographs she uses are so very gorgeous they take my breath away, but what really wowed me has been her ongoing series of blogging tips posts. This is such an act of blogging generosity as well as artistry. Those posts are as beautiful as they are informative, and her invitations to other bloggers to offer their ideas shows just what kind of friend she is to all of us. Being the biggest technical blogging klutz of the century, I am in such awe of her knowledge that I have nothing to add but a big Thank You! Patricia Gray is, in my opinion, the diva of Canadian design, and a blogger extraordinaire! Her posts are so full of beautiful images, her work is flawless, and in addition to all of that-her heart comes through,too. This girl really knows what she's doing and it shows in her work and in her posts. She was recently featured in the Washington Post "Blog Posts" because she did a fantastic post on the color Orange. Kudos, Patricia! Dianamuse is just that: a muse- She's a thinker, a writer, an artist and what an eye for beauty and grace she has! Diana did an interview with me awhile ago and this is actually what inspired me to start blogging. So she truly is my muse. I love the quotes she includes both in her posts and in other little spots around her blog. Whenever I want to experience an intellectual high and have my mind expanded, I go to her blog and let her "make my day!" I must admit it was pretty hard to narrow it down to such a few, because I think my day gets made multiple times every day by visiting all the amazing blogs out there. 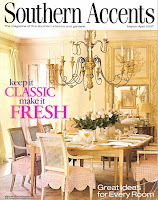 While I was gathering images for my pink Valentine's Day post, I was very tempted to include this cover of the March-April 2007 issue of Southern Accents because I love the pretty pink slipcovered chairs in this dining room. 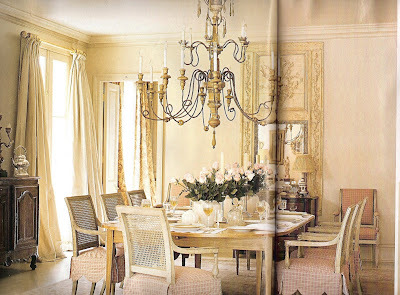 I decided to save it instead and do a post on the whole house, decorated by New Orleans "Diva of Design," Gerrie Bremermann since she is one of my favorite designers. So what, do you ask, defines the Gerrie Bremermann style? First and foremost, Gerrie has a way of using beautiful antiques to both dress up a room and simultaneously dress it down. That is to say that she furnishes her rooms with fine pieces presented in such a way as to create a relaxed and inviting setting. Her emphasis is on accomodating her client's lifestyle...with style. 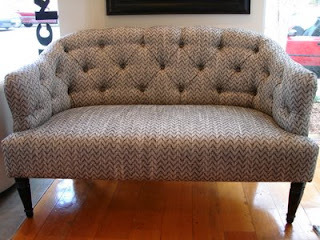 Gerrie Bremermann is known for her ability to mix luxurious silks and floral patterns with informal cottons in checks or striped patterns, and for her use of impeccable dressmaker details that elevate design elements such as curtains and slipcovers into art. In my opinion, this gives her interiors a certain sense of delight. This dining room is a perfect example of Bremermann's ability to create a balance between formality and comfort. The grandeur of the chandelier is achieved through its large size and the graceful beauty of its curving arms. It is intentionally oversized to de-emphasize the large scale of the room and make it feel more intimate. The generous silk drapes are a counterpoint to those scalloped edge pink checked slipcovers in cotton on the Louis XVI chairs. The dining table's almost rustic simplicity is balanced by the ornate trumeau mirror on the far wall, and an arrangement of silver pieces on the buffet. 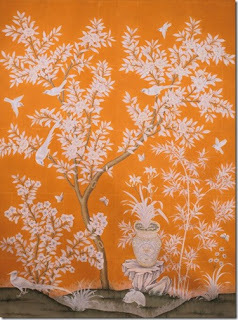 Bremerman's talent for symmetry and proportion is seen in this arrangement at the far end of the dining room. The Regence commode and the carved, mirrored sconces create dramatic tension against the more primitive glazed pottery bowl, and the mother and child sculpture lends a note of family and warmth to the composition. I love the inclusion of a bust, placed on top of a book which is resting on the floor as a finishing touch to this story of simultaneous elegance and ease. 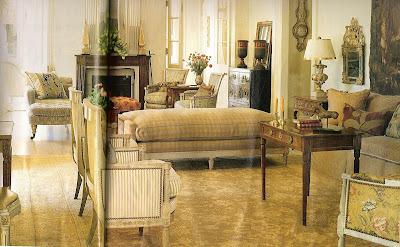 The living room is a fine example of Gerrie's use of fabulous rugs to set the color tone of the room. Understated, rich in pattern, but subtle in color, the rug is the subconscious star of this space. It is both the motivator and supporter for all the other fine elements of this room. 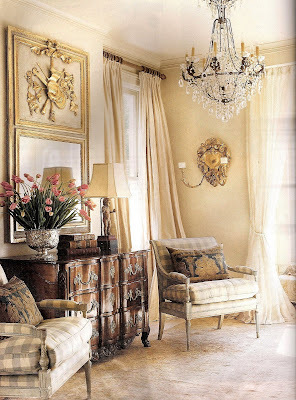 Another element of Bremermann style is the use of light neutral paint colors for walls which create a calm backdrop for the amazing antique furnishings which populate her rooms. Here again, rich silks and velvets play off simple checked and striped cottons. Painted french chairs, a requisite for every good New Orleans room, are well used here in addition to a wonderful painted daybed. Seating is arranged for comfort and interaction, and is composed so that each piece is both featured and integrated into the room. I am a great admirer of her use of beautiful pillows, many of which can be considered works of art done in exquisite fabrics and antique textiles.The furnishings in this room are so wonderful that no piece should be missed. Here is another example of a symmetrical composition. 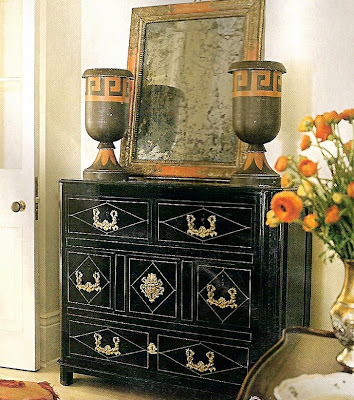 The urns with the orange-hued greek key motif and the same color on the frame of the mirror which play off the dark color of the commode bring an exciting but subtle burst of color to a corner of the living room. 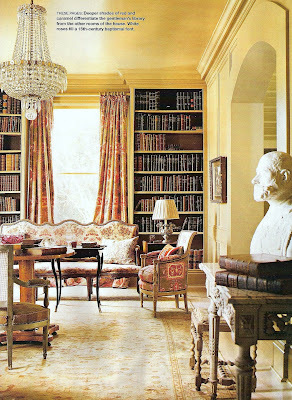 The gentleman's library offers a bit of contrast to the rest of the house, yet it still undoubtedly display's the designer's touch. 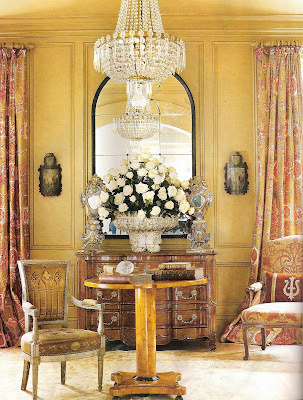 Exquisite antique furniture abounds, colors play off the subtly patterned rug, the requisite french chairs are present and furniture placement is both relaxed at times and symmetrical at others. Here, though, the wall color is a bit deeper. Of course you can probably guess that this chandelier makes my head spin and my knees weak! It's pretty dressy for a gentleman's library, and here again pretty oversized but I think it's absolutely perfect, and it's made only more perfect by being reproduced by its reflection in the symmetrically placed mirror. I wish I could get a better look at the sconces, or paintings or shields which hang on either side of the mirror. The profusion of white roses are in a 15th century baptismal font. Here, the composition of the furnishings is flawless, the fabrics are rich and patterned, and yet the overall effect is subtle. I love the beautiful red-hued pillow with the antique applique. This picture of the entry shows Bremerman style at its best. Another french commode is symmetrically arranged between two painted french chairs, upholstered in a cool cotton checked fabric, and under a fabulous trumeau mirror. The creamy walls and subtle rug are the supporting players here. The pillows made from antique textiles are the art for this space. And again, another over the top chandelier to inspire me and make my head spin. This garden room is the homeowner's "most cherished room." It isn't hard to see why. This room seems even more relaxed than some of the others in the rest of the house. All colors are soft and neutral. 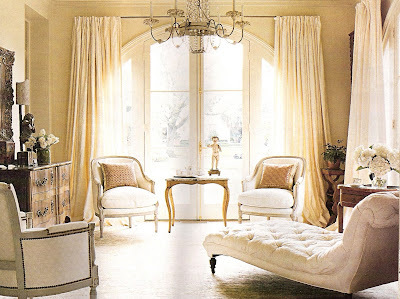 The only pattern in the room seems to be the white-on-white Fortuny silk of the simple pleated drapes. The chairs and table in front of the french doors have more graceful curved lines. But the show stopper in this room is the Napoleon III chaise longue which echos those curves and looks out to the garden beyond. 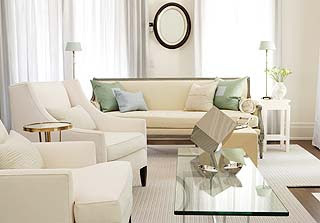 The button tufted upholstery done in a creamy shade says it all. 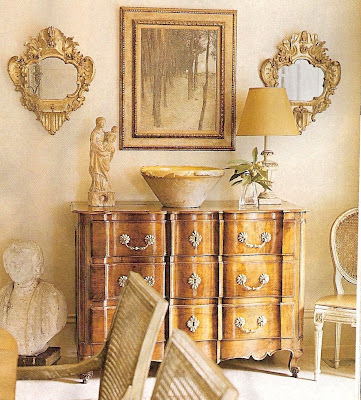 This piece embodies Bremerman style in itself: it is fine and french; it is antique and elegant, yet meant for relaxation; it is subtle and rich in perfect details; and it is here to be enjoyed by the people who live here. These people are fortunate to have a wonderful home which embodies both their lifestyle and Gerrie Bremerman's best!